Phil Mason, "Napoleon's Hemorrhoids: And Other Small Events That Changed the World"
This is a book about tiny events that had huge impacts. Some of these small events even changed the world. 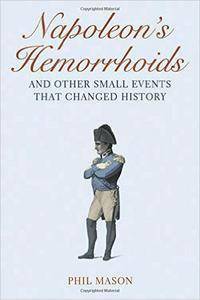 As you'll see here in Napoleon's Hemorrhoids, much of history turns out to be the consequences of small acts of fortune, accident or luck, good or bad. In the historical anecdote which lends its name to book, Napoleon's painful attack of hemorrhoids on the morning of the famous battle of Waterloo keep him from his usual practice of inspecting the battlefield. You'll learn that Marie Antoinette might have avoided execution if she hadn't changed her escape plan at the last minute and how Nixon's White House taping system which caused his downfall in the Watergate scandal was revealed by an aide accidentally. Along with history, this book also covers the fields of science, arts, sport and business. Each area is bursting with instances of major achievement coming from the smallest of beginnings. You'll also learn that one of the world's greatest nuclear scientists became a physicist only because he chose the wrong line while registering for his college classes. You'll discover how Gone with the Wind, one of the most successful novels in publishing history, came about because Margaret Mitchell, laid up with an injury, had to give up her job and stay home. How Scooby Doo, the famous cartoon dog, got his name when chance when its creator heard Frank Sinatra singing the chorus for Strangers in the Night which contains the words ‘Scooby-scooby-do' and how the Russians arrived late for at one early Olympics because they forgot they were on a different calendar and that Coca-Cola's most famous advertisement, launched in 1971 was inspired by an unplanned all night layover at an Irish airport.